On the site of the current castle, in IXe century was set up an abbey whose owners were the monks of Fulda. These grounds were exchanged into 907 with the abbey of Echternach counters other grounds. In 932, the Benedictines (Luxembourg) entrusted management to one dedicated known as "Dipoldus". Arnaud 1st with the complicity of the emperor Henri VI usurped the goods of the monks of Echternach in thanks of rendered services. 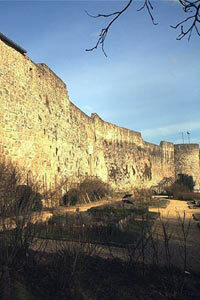 They made build the first fortress about 1190 on cliff on the current site of the castle. Gilles II, Gilles III made first remains an almost invincible fortress by surrounding it by one second enclosure bordered of a broad ditch dug in rock. Finally the alliance of the House of Rodemack with the king of France involved the confiscation of their goods by the Emperor Maximilien Ier with the profit of the Margraves de Bade in 1492 (declared Félon). Rodemack then was very disputed. Indeed: the Dukes of Orleans and Claude of Own way seized the fortress during more than one year in 1542 until with the resumption of Luxembourg by the Spaniards at the time of the treaty of Crépy in 1544. Rodemack fell again in possession from the French in 1551. 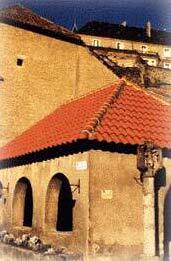 In 1552, the Spanish army took again the castle. The Duke of Own way dislodged them for the 3rd time in 1558. Henri II returned Rodemack to Spain in 1559 by the treaty of Cateau-Cambrésis. It is as well as the Duke of Bade, Philibert took again possession of Rodemack in 1563. In 1659 by the treaty of the Pyrenees, France takes again possession of Rodemack and its Seigniory. In 1662, a Franco-Espagnole conference confirms that Rodemack belonged to Spain. The French still refused into 1668 to evacuate Rodemack and this in spite of the treaty Aix la Chapelle. Rodemack was semi-officially occupied by the French during one century old meadows until 1767, May 16 at the time of the treaty of Versailles. In 1685 the Margraves de Bade lent oath to France. In 1792, the citadel is defended by a garrison of 300 men which was attacked by the army of the Duke of Brunswick. September 20, 1792, the battle of Valmy was gained by the French over the Prussian troops with the orders of Brunswick. It stopped the Prussian invasion and gave confidence the French revolution. In 1811 the castle was sold to private individuals then repurchased by the French government which gave it in a state of defense. In 1815, during 100 Rodemack days for the last time the Theatre of engagements was. The General Hugo, governor of Thionville held head to with it during 3 days with less than 500 men against 10 000 soldiers who had to withdraw themselves after serious losses. In 1821, the Treaty of Paris put an end to the consequences Napoléoniennes wars. The Prussians not having forgotten their defeat made dismantle the fort like all the northern part looking towards Luxembourg and the majority of the military buildings. The vestiges of the castle were acquired by the Baron Charles de Gargan in 1869. The stables and the house of the officers were restored and arranged in dwelling about 1900-1910 by the family of Gargan which in is still at the present time owner.